Giulio de Medici, Knight of the Order and Grand Prior of Capua, elected Pope as Clement VII, appealed to the Emperor Charles I, King of Spain, who on the 24th of July 1530 at Castelfranco di Emilia, granted in perpetuity a noble and free feud of the Maltese Islands and Tripoli on the African coast, confirmed by papal bull. The Order was obliged to present in perpetuity, every year, on All Saints Day, one falcon as a symbolic homage to the King of Spain and to his successors as Kings of Sicily. Since then the Knights of the Hierosolimitan Order of Saint John the Baptist were known as the Knights of Malta, and the Maltese Islands their sovereign state. The Malta island, until then almost deserted, became the bastion of defense of Christianity. Always in fighting order, the agile crusader navy patrolled continuously the sea and kept protected the defenseless shores of Sicily and Italy, replacing the military deficiency and slow actions of the royal fleet. Meanwhile the Turks, after occupying Buda, were menacing Vienna with their proximity. 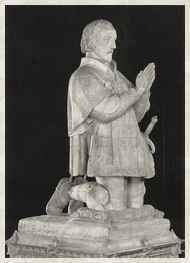 In 1534 Grand Master Phillipe de Villiers de l'Ile Adam died. Everybody wept at the death of this devoted and valorous commander. Soliman the Magnificent himself, ordered to read in all the mosques a memorial account about the great achievements of his old adversary. However he decided to annihilate the Order and, in the summer of 1551 put siege to Malta. The Turks were sailing in vain around the island without daring to attack, because the Knights had built a powerful fleet that was the sentinel, not only over Malta, but also over all Mediterranean Sea. 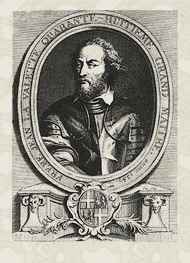 Beginning on the 18th of May 1565 the Knights, commanded by their Grand Master, Jean Parisot de la Vallette, suffered what the historians called the Grand Siege. A fleet of 200 vessels with 50.000 Muslims launched an attack in the name of Allah. For almost four months the Knights, with only 9.000 soldiers, resisted and killed more than 20.000 enemies. La Vallette, in spite of his age of seventy years, was in the front line. When Soliman II was informed that were arriving reinforcements, sent to the Knights from Phillipe II King of Spain, and commanded by Don Garcia of Toledo, Vice-King of Sicily, he died at the age of 72, due to a fit of anger. On the 7th of September 1565 the Ottomans lifted the siege. The defeat of Rhodes had been vindicated. The Turkish loss their naval power in the Mediterranean Sea, and for two centuries Malta remained inviolable. That victory had a vast echo in Europe, and the Fleet of the Order became one of the most powerful in the Mediterranean Sea. Together with the armada of the King of Spain, the Order participated in three glorious ventures: in 1541 the conquest of Algiers; in 1551 the undertaking of Zoara; and in 1559-60 the expedition to Tripoli and the conquest of Djerba island. On 24th of May 1571 prompted by Pope Pius V was constituted the Holy League with the participation of Spain and Venice. To the Fleet, commanded by Don Juan of Austria, son of Emperor Charles I King of Spain joined some galleons of the Order. On the 16th of September of same year the Fleet of the Holy League set sail. On the 7th of October the battle of Lepanto begun. The Knights occupied a paramount place on the battle, and contributed chiefly to obtain the resounding victory. Almost all the survivors were wounded and 60 Knights died. They captured 160 galleys, set on fire 80 and send to the bottom of the sea more than 30.000 enemies. The crepuscule of the Crescent Moon started after the battle of Lepanto, culminating with the decline of its naval force. But the military commitments would never overcome the hospitaller vocation of the Knights. The Hospital of Malta was unique in the world: marble floors, tapestries on the walls, table silverware, and beds tended with sheets on fine linem, a luxury that did not exist in any other place at that time. Schools of anatomy, medicine and surgery were established in Malta. With the help of the Pope and of the Kings of France, Spain and Portugal, the Knights built palaces, churches and the beautiful Cathedral of Saint John of the French. The Palace of the Grand Master, still has today an extraordinary gallery of armors and ten magnificent Gobelins tapestries based on the theme “The Big Oriental Indies” donated by the munificence of Luis XIV. The French Revolution broke over Europe like a storm. 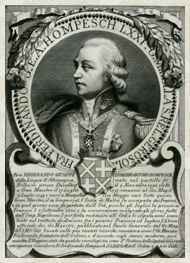 The Hospitallers patrimony in France was confiscated in 1792 and afterwards in Italy. The Orders of Knighthood were suppressed by the Revolution. On the 7th of June 1798 the first frigates of the expedition to Egypt of the French armada arrived in front of Malta. The 9th of June, General Napoleon Bonaparte arrived with the gross of the armada. In the morning of the 12th Napoleon disembarked and entered on foot in the city of La Valletta. Due to the great strategic error of the weak and hesitating Grand Master, the German Ferdinand von Hompesch zu Bolheim Napoleon seized the heritage of glory and blood of the Knights without fighting, in exchange for a promise never kept: to welcome the Knights in France in accordance with their rank. Malta, which had resisted the Turks and the pirates for centuries, opened its doors to the enemy. The Napoleonic soldiery, worthy sons of the Revolution, sacked and robbed continuously everything they could. On 19th June Napoleon left with the French armada for Egypt, leaving 1000 men under the command of General Claude Vaubois to defend the island. The Malteses, helped by Britannic troops, fought against the French forces, who capitulated and abandoned the Island. The Britannic flag waved over the island on the 5th of September 1800. The loss of Malta could had mean the end of the Order. But the Order, as the mythical avis Phoenix, reborn from its own ashes, did not and would never die. Ironically, while the properties of the Order were being openly pilfered by everyone, without punishment, and its territory invaded, the six great European powers were signing the Treaty of Amiens on the 27th of March 1802. This international Peace Treaty recognized and provided for the independent reestablishment, protection, perpetuation and sovereignty of the Order of Saint John of Jerusalem. This Sovereignty, gained at Rhodes in 1308 and recognized by the Treaty of Amiens, never ceased to exist with or without territory. It is a principle of International Law that a right once vested does not requires the continued existence of the power by which it was acquired for its preservation. If a treaty, or any other law, has been applied by recognizing a right, the expiration of the treaty or the law cannot extinguish that right.